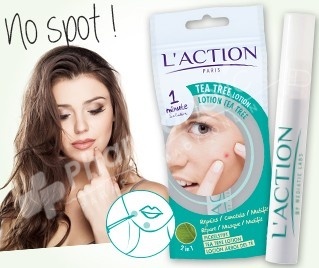 L'action Paris 1 min Solution Tea Tree LotionMore gentle on your skin than pure Tea Tree Oil yet just as effective, this lotion soothes as it heals. If you experience spots, cuts, cold sores or skin conditions make sure you always keep some on hand! What better to reduce painful spots and scars than the natural remedy of Tea Tree? Our Tea Tree Lotion is an incredibly versatile tonic for your skin, reducing grease and shine whilst healing and relieving pain. Spots, sores and imperfections are reduced. Your skin is mattified, reducing grease and shine which helps return the natural glow to the skin. Dab over problem areas three times a day or more if required.